... you know you've done good. Despite the dry spells, seemingly endless hours of work, unpredictable revenue, and being a one-force "team", since I started freelancing two years ago, I never questioned if I'm doing the right thing. I have revisited my methodology, my strategy, my service offerings, but not my path - up until a week ago. I'll admit, it came out of nowhere. I wondered if I am digging myself into a dark hole or if I am working a path. Am I growing or stagnating? Will I regret this? Am I missing out on better opportunities? Better being a steady income with benefits. Of course, the answer is that I really am working a path. Yes, it is a path that requires patience, discipline, determination and a ton of security, but each day I am honing in on my strengths and focusing on a handful of service offerings. Each day I am facing my weaknesses and working on conditioning those productivity-boosting muscles. I am absolutely growing. I continue to educate myself to build up my skills, and I work to stay on top of the latest market trends on the internet, in social media networking, grass-roots marketing, writing and graphic design. My portfolio continues to grow, and although I thought I was a self-motivator years ago, that was nothing compared to how I keep myself going these days. Receiving a thank you card from my client, not only boosted my ego, but energized my entrepreneurial spirits. I will be revisiting my business plan and re-tweaking my strategy and service offerings, but I will not deviate from my path. It's all true! 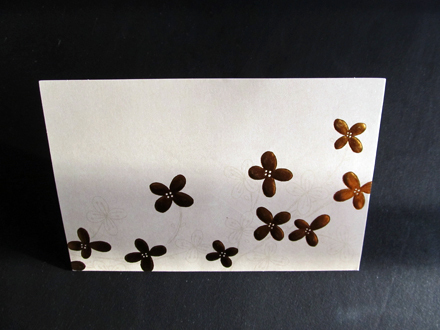 I'm just glad that our little card was meaningful to you. One day you'll be so busy that you will have to turn work away, and I hope you always maintain that humility and love of the work. We really appreciate you! :))))))) Just like you said, setbacks don't mean we are not growing, they mean we ARE growing!